We feel incredibly proud to be able to announce that a new friend has joined our family of joy here at Saint Margaret’s Centre. A lovely boy, aged 5-years old, with sparkly eyes and curly hair. His name is Laurentiu-Petre Paraschiv (D.O.B. 24.02.2014) and until recently, he had been living with his parents, paternal Gran and older sister. His health got increasingly worse and the medical care became a complicated endeavour for the parents. They then asked for the maternal Gran to step in but, unfortunately, she doesn’t have the funds and/or medical skills required to care for him. 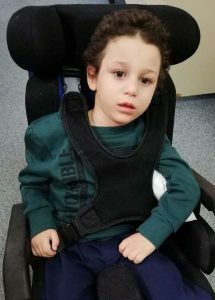 Our team of social workers was informed by local authorities about Laurentiu-Petre’s story and we took all the necessary steps to have him relocated to our facility where he is now offered around-the-clock care for such special children. We are confident that the maternal Gran will continue to visit her grandson and make sure he has everything he needs during the next few months. She is the family member that will hopefully remain close to Laurentiu-Petre and will continue to share beautiful moments together. If you would like to learn more about Laurentiu, please call 0141 559 5690 and speak to Julian.